If you want wonderful beaches, guaranteed warmth and sunshine, sparkling water and a laid back atmosphere then the Tenerife holiday resort of Los Cristianos fits the bill. 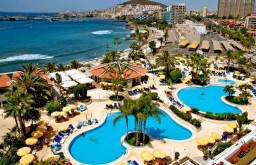 Los Cristianos is often referred to as one of the more popular resorts in the Canary Islands. Virtually next door to the lively resort of Playa de las Americas, the resort is just 15 minutes south of the main Tenerife Reine Sofia Airport. The los Cristianos resort was developed out of what used to be an old fishing village and this is still a harbour town with plenty of colourful boats ready to take tourists on a trip of the bays. Quieter than its neighbour Playa de los Americas, Cristianos still has a lot to offer its visitors. There are plenty of holiday apartment blocks and hotels in the resort, as well as some top class eating establishments. The main Las Vistas beach is man made and the sand imported from the Sahara desert its sheltered harbour offers calm waters which are great for swimming. There are plenty of sea front cafes and bars near beach, which is just five minutes away from los Cristianos town centre. A walk along the promenade will take you to the neighbouring resort with its lively night life. There are plenty of excursions available at the resort allowing you to see all that Tenerife has to offer its visitors. There are regular boat trips round the harbour, and further out to watch the whales and dolphins and every beach activity that you can think of, including scuba diving and wind surfing. There are plenty of great places to eat in the resort, from top class restaurants to pavement cafes and laid back bars. There are also plenty of fun pubs offering karaoke and a few night clubs. If you want to dance the night away at a livelier pace then the neighbouring resort of Playa de las Americas offers bars and night clubs galore. Los Cristianos has managed to retain some of the features of an original fishing village with winding cobbled streets alongside the more modern aspects of the town. There is plenty of great shopping to be had in Cristianos, whether you are looking for designer clothing or a bargain in the weekly market. Tenerife has plenty of theme parks that are easily accessible from Cristianos because of its proximity to the motorway. Siam Water Park Kingdom is a must see and the larges water park in the whole of Europe. Tenerife Zoo and Monkey Park are also worth a visit and if you like museums and architecture then take a trip to the capital city of Santa Cruz. Most people who come to los Cristianos return year after year to enjoy what the town has to offer and because they know that there is a virtually guaranteed year round temperature of 20 degrees and above. If you are looking for a holiday where you really can please yourself whether you spend your days on the beach or you take part in some of the many activities on offer, then los Cristianos is for you.